We Reached Our Goal for the Highmark Walk! For the first time ever, we reached our goal for the Highmark Walk for a Healthy Community! We wanted to raise $20,000 to raise and train one service dog, and we did it! We had such an amazing group of walkers this year. One hundred and forty-two people signed up to walk and raise money for us. Thank you so much to everyone who raised money or donated! We still have some checks that we need to add to the total, but we will let you know the final tally soon! The success of the Highmark Walk for a Healthy Community is a perfect example of what people can do when they come together for a cause they believe in. Just one example is the school students who came together to raise over $650 for us! SSD Hendrix's puppy raiser is a teacher, and she started an after-school walking club. The fourth graders walk two miles with Hendrix every Tuesday and Thursday. When the Highmark Walk was coming up, Hendrix's puppy raiser asked her walking club if they wanted to join the Walk. With permission from the principal, the walking club began building their endurance so they could walk three miles, and Team Hendrix began. They didn't stop there, though. Team Hendrix got the entire school involved in raising money. They asked the students in each classroom to bring in a dollar to support SSD. Daily announcements were made about helping to raise money to train dogs like Hendrix to assist people with disabilities. The fourth graders even got on the morning announcements to talk about how they were walking and having fun with Hendrix. It became a school project. 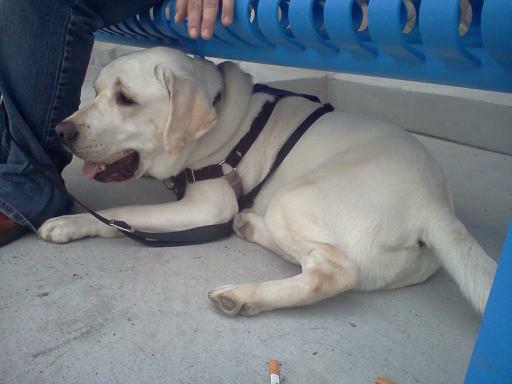 When Hendrix and his puppy raiser walked through the halls, students would stop and say "I'm bringing in a dollar!" or "I brought in a dollar!" In the end, Team Hendrix and the entire school raised over $650! This is just one example out of many of people who opened their hearts and came together to raise money to change a life. Thank you so much! 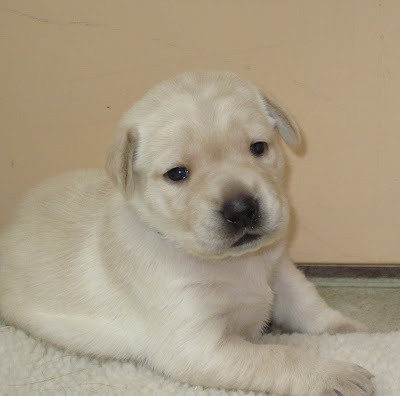 The American Heroes puppies are live on our puppy cam! Ripley, Judge, Parks, Keller and Hale are growing quickly, and now you can see for yourself how they're learning to play and explore their surroundings. 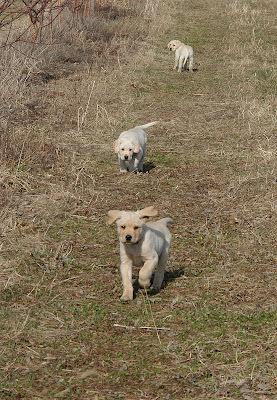 In a few weeks, these pups will need puppy raisers. Would you like to give them a home for 15-18 months? You'll get to teach the puppies basic obedience, good house manners and various other skills - and of course, give them lots of love. If you live in central or northeastern PA, just complete our online puppy raiser application to become a puppy raiser and change a life. 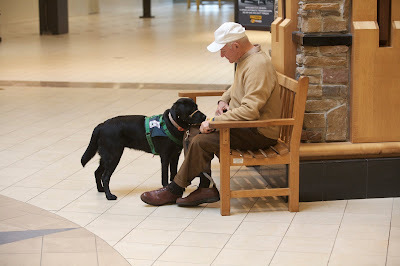 When service dogs or dogs in training go out in public, they always draw attention. For the past year and a half that Donna has been raising Nubble, he has opened the door to many conversations with people. In fact, many local people are no longer strangers because of Nubble. They often stop and greet him by name. Many adults ask if they can pet him, and most people know that they shouldn't just stop and pet him without permission. One time, as Donna and Nubble were walking through a store, she heard a little girl whisper, "Mom, I thought doggies weren't allowed in stores?" Donna likes when she hears parents explaining what a service dog is to their children. She also really likes when people ask about him. "I never want someone to feel like they can't ask me a question," she says. 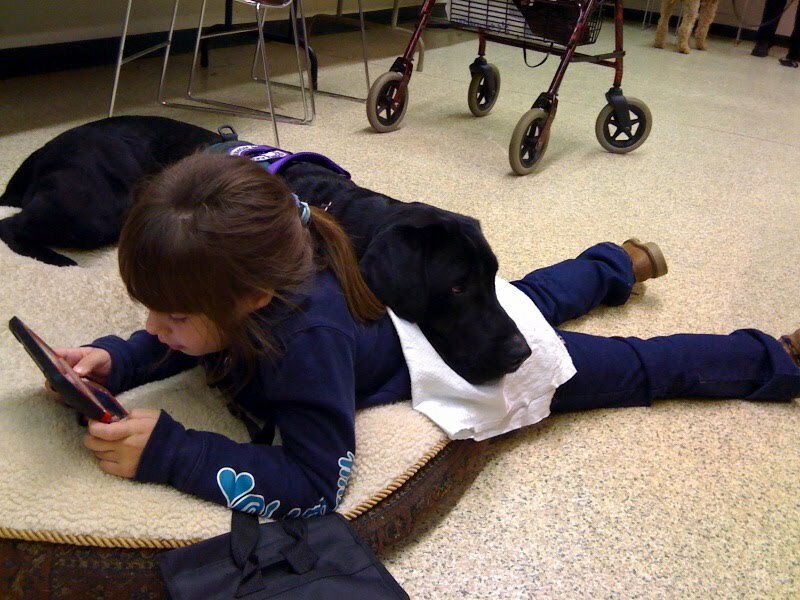 Many people don't really know what a service dog is. 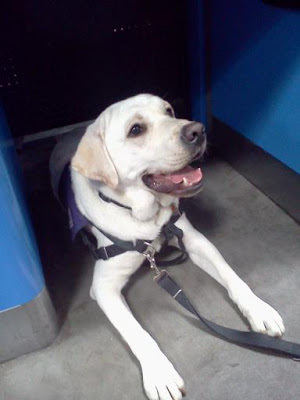 They often assume that Nubble is going to be a guide dog or a police dog, and Donna enjoys having the opportunity to educate people about service dogs. When people learn that Nubble is being trained as a service dog, they usually ask many more questions. They ask Donna what she feeds him, what's in the treat pouch and what is the clicker. Some kids ask if they can give him one of the treats, and some adults actually have their own treats in their pockets. Although Donna feels bad telling them that Nubble can only get treats from her, most people understand, especially once she explains that if she let's them give him treats, he'll start to expect treats from everyone he meets. As a service dog, he will need to stay focused on his partner, not on other people. If you would like to see more of Nubble in public, come to the Highmark Walk for a Healthy Community this Saturday! He would love for you to join him. If you can't make it to the Walk, please make a donation to support Nubble and Susquehanna Service Dogs! 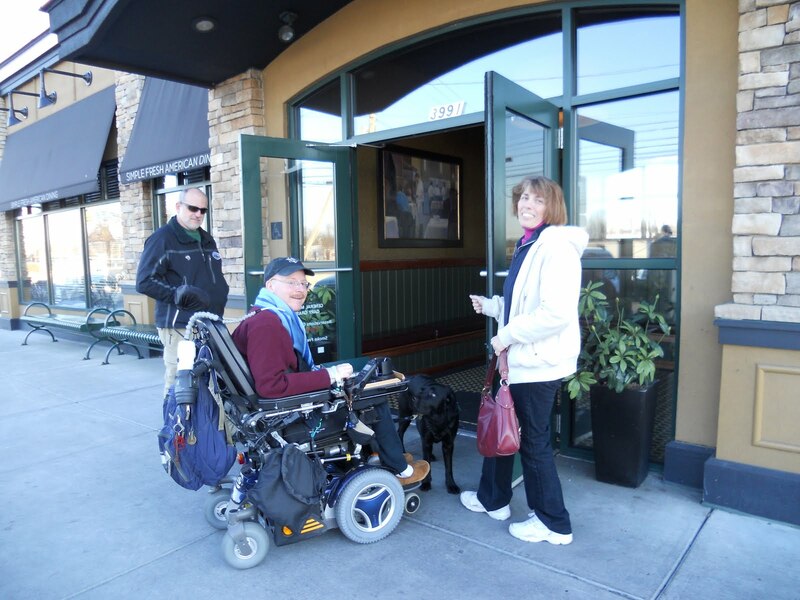 In April, Nubble had a lot of opportunities to go out in public. Donna, his puppy raiser, had time to take him almost everywhere she went. 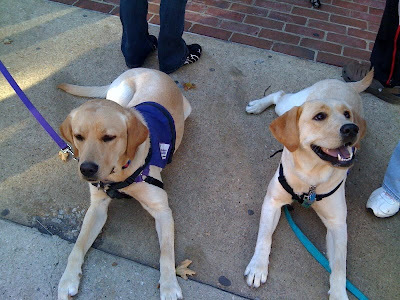 Whenever our puppy raisers take their puppies in training out in public, they want to make sure the dogs are going to have a successful outing, which means they may need to slow down and focus completely on the dogs, especially if it's a challenging public place, such as the grocery store. If our puppy raisers are pressed for time, they may choose to leave their puppy in training at home to avoid a stressful situation. This past month, Nubble was one busy, traveling dog! He went to two of Lindsey's soccer games, Cabela's, the grocery store, the bank, Wawa, the kennel, the airport, Walmart and several nature walks. Lindsey plays on her high school soccer team, and Donna decided to take Nubble to his first soccer game. The first time was very challenging for Nubble. The game had already started when they arrived, and not only was there a ball flying around the field, but Lindsey was playing. Donna and Nubble made it to the bleachers, but he became even more excited rather than calming down. When Nubble is in a situation where he is unable to calm down, Donna moves him back to the place where he can see the situation but still be calm. Then, they slowly move forward a little bit at a time as long as Nubble is able to stay calm. At the soccer game, Nubble was only able to calm down when he was next to the car. It was actually very discouraging for Donna because she was hoping to take him to her daughter's soccer games. However, although she was discouraged, she didn't give up on Nubble. Three weeks later, she and Nubble tried attending another soccer game. This time, Donna went to Lindsey's junior varsity game by herself so she could be sure to see her play. Then she went home to get Nubble for the varsity game. That way, if Nubble wasn't able to calm down enough to enter the stadium, Donna wouldn't get stressed because she couldn't see Lindsey play, and that stress wouldn't be communicated to Nubble. At Nubble's second soccer game, he successfully made it into the bleachers for the game! Although he barked in the beginning, he did settle down. They went up the ramp, so Nubble got to walk on a strange surface. And then he settled down nicely in the bleachers. he was very aware of the ball and the soccer game, but he was good. Excellent progress! After the game, Donna had him practice stairs on the bleachers, and even though he stopped and started again several times, he didn't try to turn around and go up the stairs backwards! Nubble went to Cabela's, and of course, he practiced stairs. Donna and Lindsey also took him to the shooting gallery arcade, where someone was practicing his marksmanship. Nubble barked at first, but after Donna clicked and treated him for being quiet, he soon got the idea that he should be calm, and he settled down. He watched the shooting area and noticed every movement whenever another target popped up. Then Lindsey helped work on "leave it." She bounced a ball, which Nubble tried to pounce on. He eventually figured out that he got a treat if he didn't pounce on the ball. By the end, it was in a nice down, watching Lindsey bounce the ball and the man practice shooting targets. It was a challenging situation for Nubble, but he did very well. 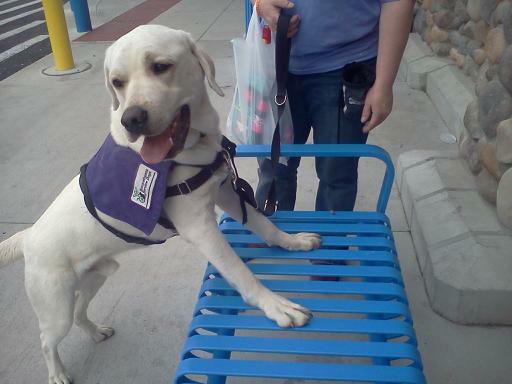 At Walmart, Donna found a blue bench to use as a training prop. Nubble practiced "up," "under," and "leave it" here at the bench and at the checkout. Now that the weather is getting nicer and the days are getting longer, Donna and Nubble have been taking some nice trail walks. One time they got caught in the rain. Nubble had a grand old time walking from puddle to puddle! They were walking near the lake, and startled a couple of ducks. Although Nubble flinched, he then stood perfectly still without barking! Gizzy, the family dog, came along for another trail walk, and she and Nubble saw a herd of deer. Five deer came out of a meadow and crossed in front of them, and the dogs didn't know what to think. At first, Donna thought Nubble was just going to watch them, but then Gizzy barked, which set Nubble off. Both dogs were barking, but those deer just continued moseying along. Then Nubble took an odd step and stepped right out of his EasyWalk! Donna had to quickly grab his collar and redress him in the EasyWalk while holding on the Gizzy at the same time. But other than the adventure with the deer, the walk went quite well. The Northeast group held one of their meetings outside, and they practiced recalled in a fenced-in field. Nubble played very nicely with SSD Ben. The dogs played on a jungle gym, and Nubble even went up and down some steep steps! All the dogs wend down a short slide, and they practiced walking on a textured ramp. Kids were playing nearby, but Nubble didn't focus on them. He did great! At the end of the month, Nubble had his end-of-the-semester puppy class evaluation in Harrisburg. He and Donna were in a different room than the room where we typically hold puppy class, and at first Nubble was very uncertain about being in a new place. It took him a while to settle down, and even then he was still very interested in what was going on in the other parts of the building where other dogs were also being evaluated. He did do some very nice shaping, and he gave a nice "under." He needs to work on paying attention to his handler and "leave it." Donna has been working on "doggie zen," ignoring food and other distractions, each day, and she does see an improvement. She plans to spend more time practicing doggie zen with him. Check back tomorrow to read about Nubble and the people he meets when he goes out in public! Meet the American Heroes Puppies! 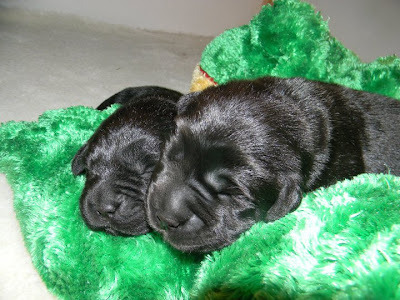 Guest post by Diane and her family, who are taking care of SSD Dee and her new puppies. Thank you to everyone who submitted names for SSD GEB Dee's American Heroes litter! We received many wonderful suggestions that were carefully considered as we made our final selections. We believe the names we selected attests to the variety of significant contributions American heroes have made in establishing the rich heritage that is our great country, America. After a difficult selection process, we have chosen to honor the following men and women for the substantial and enduring impact they have made in setting examples for our children in today's America. Each person has a unique story; however, they all consistently demonstrated exceptional courage and commitment in the face of extraordinary challenges that will forever distinguish them as heroes. We hope you enjoy the names! John Walter Ripley (1939-2008) was a United States Marine Corps officer who received the Navy Cross for his extraordinary heroism during the Vietnam War. On Easter 1972, Captain Ripley repeatedly exposed himself to enemy fire while he attached explosives beneath the bridge at Dong Ha, successfully destroying it to hamper the North Vietnamese Army's advance into South Vietnam. His action is considered one of the greatest examples of concentration under fire in US military history, and he is legendary among the Marine Corps. Mychal Judge (1933 - Sept. 11, 2001) was a Roman Catholic priest of the Franciscan Order and the chaplain of the New York City Fire Department, and he became the first official casualty on September 11. During the September 11, 2001 attacks, Judge rushed to the World Trade Center when he heard it had been hit. He immediately began praying and administering aid to the rescuers, the injured and the dead in the lobby of the North Tower. He was killed when debris from the collapsing South Tower flew through the lobby and struck him in the head while he was praying. Rosa Parks (1913-2005) was an African American civil rights activist. In 1955 during the Civil Rights Movement, she refused to give up her seat on the bus to make room for a white passenger. Her action sparked the famous Montgomery Bus Boycott, and she became an icon of resistance to racial segregation. She collaborated with civil rights leaders, including Martin Luther King, Jr. Congress has called Rosa Parks the "first lady of civil rights" and "the mother of the freedom movement." Helen Keller (1880-1968) was an American author, political activist and lecturer, and she was the first person who was deaf and blind to earn a bachelor's degree. The story of how Anne Sullivan, Keller's teacher, taught her to communicate has become well known. For forty years, Helen Keller and Anne Sullivan traveled around the world, helping the public overcome their misconceptions of people with disabilities. Clara Hale (1905 - 1992) was an African American humanitarian who raised over forty children in her small home in Harlem. At the age of sixty-three, she founded the Hale House Center, a home for unwanted children and children who were born addicted to drugs or who had HIV/AIDS. Throughout her life, Hale helped over one thousand children of every race and ethnicity. For Dee's stillborn puppy, our son Joe suggested naming her after someone who had a continuing legacy. After reviewing your suggestions, we selected Dorothy Harrison Eustis, whose legacy involves service dogs. Eustis (1886 - 1946) was an American philanthropist and dog breeder who worked with German Shepherds. She established and endowed The Seeing Eye, Inc., and other groups for training guide dogs. Your mother fed you when you were hungry, made all your cuts and bruises feel better with a kiss and a bandaid, and rocked you to sleep at night. She was a guiding hand as you took your first steps out in the world. As you started to make your own way, she offered you wisdom, support, a shoulder to lean on, and always, her unconditional love. 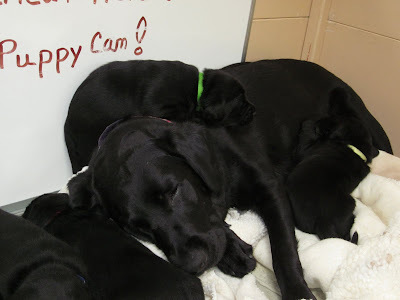 Just like mothers do, service dogs change lives, whether they're assisting their partners or caring for a future generation of service dogs, like new mother SSD Dee and her American Heroes puppies. Their loving dedication gives their partners the confidence to go out on their own and fulfill their goals and dreams. 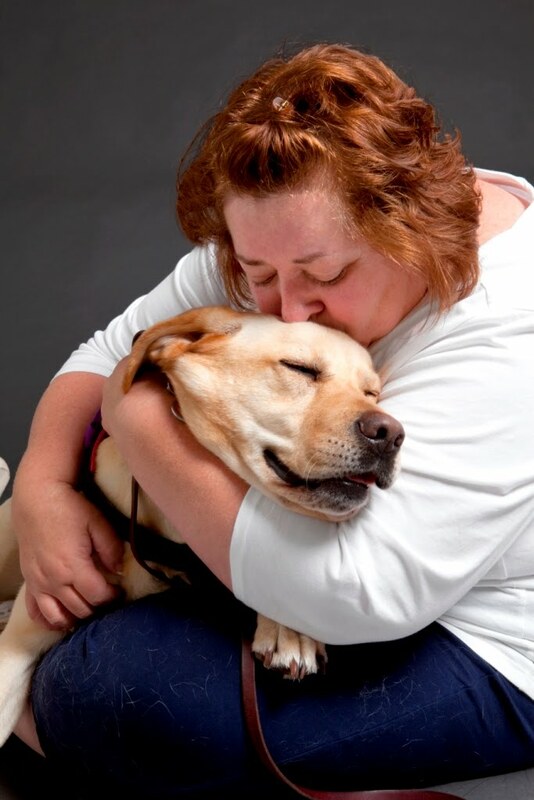 This Mother's Day, show your mom how much she means to you by giving a donation in her name to Susquehanna Service Dogs. Celebrate your mother's love and dedication by giving the gift of independence to someone just like you. Give a gift in honor of your mother. Happy Mother's Day to all of the mothers whose love and dedication makes all things possible! 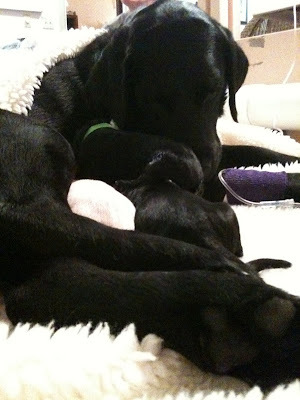 SSD Dee gave birth to her puppies yesterday! We're very happy to welcome these new pups into our program! We knew that Dee was due to give birth in the beginning of May, so when we found that she had gone into labor in the morning on May 2, our whelping team was ready. At 2:13 p.m., Dee gave birth to her first puppy, a large, black male that weighed 19 ounces. Because this puppy was so big, she had some difficulty delivering him, but our whelping team was right there to help her. 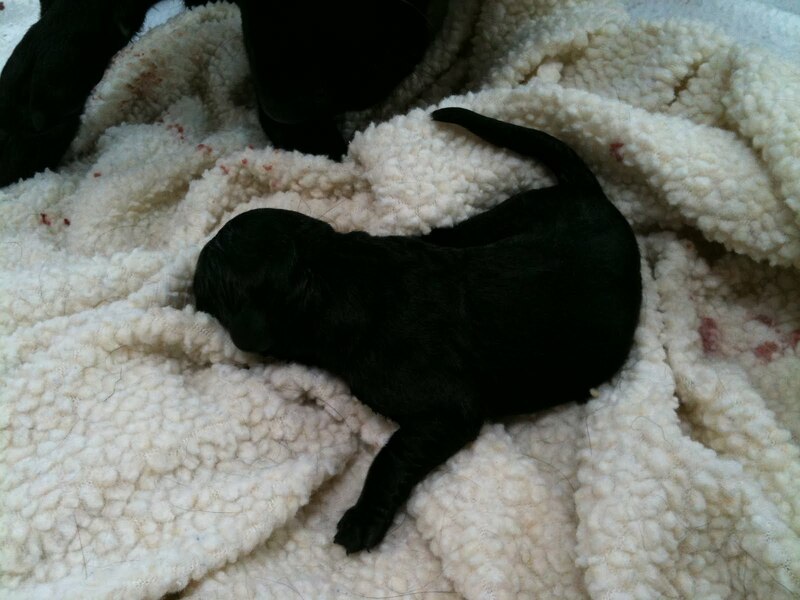 Her second puppy was born easily at 2:32 p.m. - a slightly smaller black female. Anytime one of our dogs give birth, we always have the vets at Palmyra Animal Clinic on call, just in case. Our first priority is to make sure that the mother and puppies are safe and healthy. Dee was having a difficult time delivering her third puppy, and we stayed in close contact with the vet. We had Dee walk around a little bit and gave her massages and nutrients to keep her energy up. One puppy may sometimes take several hours to be born, but after a few hours, we decided that it would be best to take Dee to the vet. We carefully loaded her and her two puppies into the car and drove them to the Palmyra Animal Clinic. 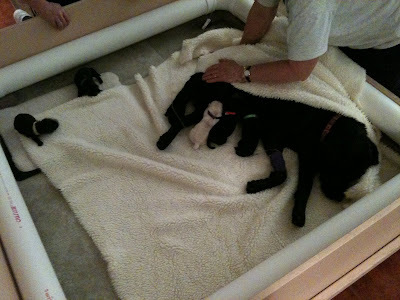 The vets took wonderful care of Dee and her puppies. Dr. Clements and Dr. Hahn performed an emergency c-section and delivered four more puppies - two yellow females, one black male and one black female. Sadly, one of the yellow females was stillborn. She will be named and buried in a special area at the home of one of our volunteers. We were thankful to leave the vet with five large, healthy puppies and a healthy Dee. 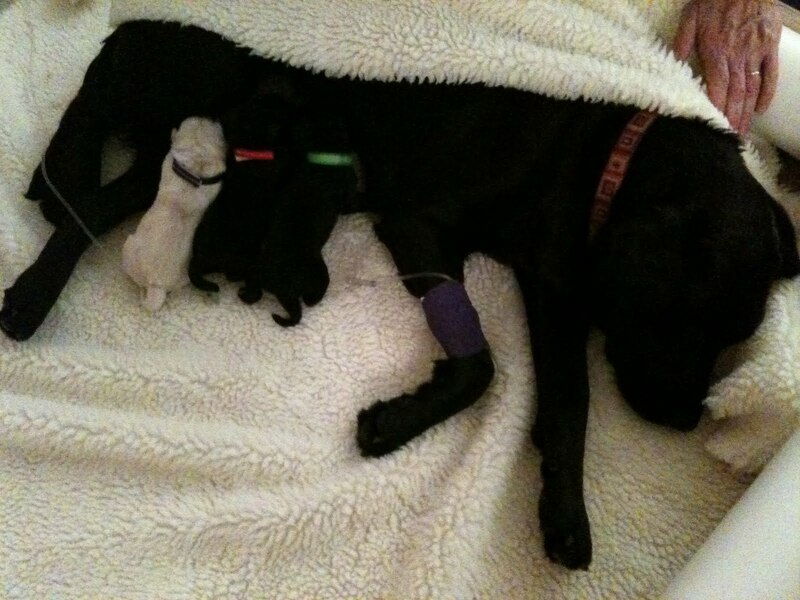 Dee went home on IV fluids to make sure she stays hydrated after her surgery, but she and her puppies are doing fine. Thank you so much to our whelping team, Dee's breeder caretakers and the wonderful vets at Palmyra Animal Clinic! 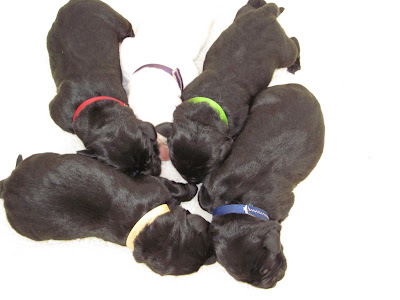 We will be announcing the names of these American Heroes puppies soon. There's still time if you'd like to suggest a few more names! 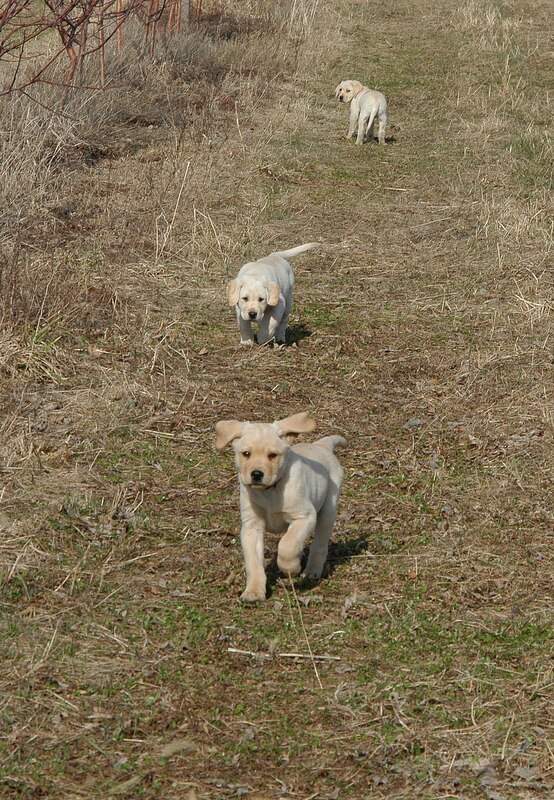 We're looking forward to watching these big puppies grow and learn to be service dogs. Congratulations to Our 2011 Service Dog Team Graduates! Congratulations to all of our service dog teams who graduated on Friday! We held our annual Graduation and Volunteer Appreciation Celebration last week. Fifteen service dogs and facility dog teams, three companion dogs and two demonstration dogs graduated. We're so happy for all of our graduates, and we wish them well in their lives together! 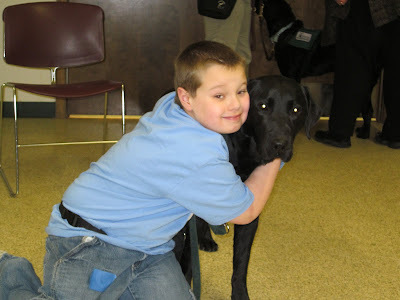 Thank you so much to all of our volunteers who made it possible for these dogs to become service dogs they are today! Thank you to our puppy raisers for raising them, teaching them good house manners, taking them out in public and giving them lots of love. Thank you to our puppy sitters and kennel sitters for taking care of the dogs in training on weekends or whenever they're needed. Thank you to our breeder caretakers, who take care of our breeding dogs, and thank you to our whelping team who go on puppy watch for hours so they can be right there to care for mom and puppies during the birth. Thank you to our volunteer trainers for helping us train the advanced training dogs in public. Thank you to our Team Training volunteers who assist our new service dog teams as they first learn to work together. And thank you to everyone who provided those delicious lunches during Team Training! Thank you to everyone who did a demonstration or spent time at a booth to show the community what service dogs can do to assist people to be more independent. Thank you to everyone who helps out with the office work. You help keep us running smoothly! Thank you to our volunteers who do preliminary interviews and home visits with individuals who have applied for a service dog or who have received a service dog, and thank you to everyone who helps us re-certify our working teams. Thank you to everyone who helps at our events, such as PawsAbilities and Summer Camp. Thank you to all of our volunteers who work with our volunteers! And finally, thank you to everyone who supports us by donating, reading our blog, visiting us on Facebook and Twitter, and helping us raise awareness about service dogs and the incredible ways they change lives! 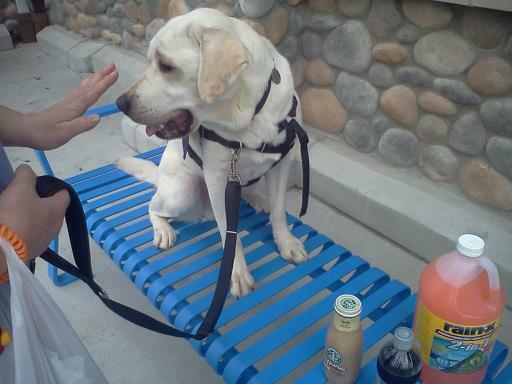 We would not be able to raise and train service dogs without the help of all of our volunteers. You make Susquehanna Service Dogs possible. You change lives!